Nikolai and my hubby love gazing at the stars and they have a collection of telescopes to do so, I have joined them several times but I am not as interested in space happenings as they are. I do, however, remember singing to Nikolai the Twinkle twinkle little star song when he was younger, as my mom also sang it to me when I was little. 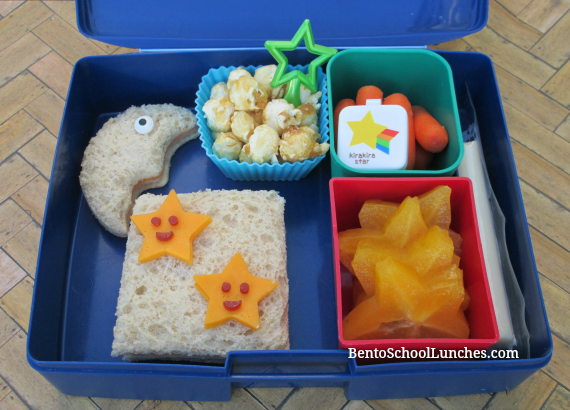 I was happy to have star fruit on hand to be included with his lunch and this lunch was packed in a Laptop Lunches bento box. Main compartment: A square shaped sandwich topped with star shaped cheddar cheese and fruit leather facial details, moon shaped sandwich with icing eyes and some popcorn in a silicone cup. Top right: Organic baby carrots and ranch in small container. My kids' love classic songs! Cute lunch!! Adorable! I've nevereaten star fruit but I hear it'sdelicious. Does it need to be peeled? It looks like it would be difficult to peel. Lovely lunch! Wow, so cool, must be fun for them to look through the telescope. So fun! Love this starry themed lunch!